Opendoor is a San Francisco based start-up that steps into the real estate business, trying to make this process as easy as possible for the sellers and buyers. They are basically an intermediary in the market that brings together buyers and sellers. They buy real estate for cash, fix it and sell it for a small premium. Opendoor uses an algorithm to determine what price to offer to the people that want to sell their homes via Opedoor. This algorithm includes thousands of variables, including for example square footage, numbers of bedrooms etcetera. Furthermore, Opendoor uses questionnaires to determine the preferences of the buyers and sellers, incorporating this in their model. In this way, the customers are actually co-creating the houses that Opendoor fixes. In the future, Opendoor also wants to offer customer mortgages and home decorations. Overall, the value that Opendoor adds is providing a service that takes away the burden of the customer to buy or sell houses and using the preferences of the customers in this process. When we look at the efficiency of the value system of Opendoor, we can look at two criteria, the joint profitability and the feasibility of required reallocations. (Carson et al., 1999) Opendoor definitely offers joint profitability, because consumers can easily sell or buy their homes via the platform, and Opendoor can profit by making money from the fixed houses. The second criteria is more difficult because Opendoor solely depends on investors and loans and when they don’t make profits they cannot reallocate their assets to satisfy their investors. Next to that, trust issues are also important to take into account. Opendoor cannot see the homes before they make an offer an have to rely on trust. Finally, competitors will not be that happy with Opendoor and therefore legal aspects will be important to consider while expanding. The business model depends on whether the algorithm is right or wrong. If it is right then Opendoor will earn money, however, if the price is lower, Opendoor will make a loss. Next to that Opendoor pays in cash and loans this money. It is dependent on investors and if they encounter a low in the market they have a problem. They did not face a crisis like the one in 2008. All in all, let’s keep a close watch at this company and see whether they will conquer the real estate market. Forbes Welcome. (2017). [online] Forbes.com. Available at: http://www.forbes.com/sites/amyfeldman/2016/11/30/home-shopping-networkers-opendoor-is-upending-the-way-americans-buy-and-sell-homes/ [Accessed 14 Feb. 2017]. Opendoor. (2017). [online] Opendoor.com. Available at: https://www.opendoor.com/about [Accessed 17 Feb. 2017]. Today, one of my group members stained my suede jacket with permanent marker whilst discussing our business idea. After panicking, the first thing I did is type the sentence “how to get ink out of suede” into Google. The pages I end up at are online communities, in which people share their experiences on the same problem and provide me with the knowledge I need to remove the stain. This example might sound very familiar to you: There are more than 2550 of such communities worldwide! These online knowledge sharing platforms provide a space for social interaction where individuals can obtain knowledge and feedback and exchange opinions on certain topics, such as stain removal. Nowadays, the strategy called co-creation has taken the business world by storm and many firms try to hop on board. Co-creation allows companies and customers to interact with each other by creating a customer experience that is valuable for both parties. On one hand firms get a better grasp of the wants and needs of their customers, while customers on the other hand feel that their ideas are valued and their needs get fulfilled. There are number of ways how to induce innovation in the different fields. One of the interesting methods for generating new innovative ideas and approaches is crow contesting. Crowd contesting is an open contest that allows anyone to participate with his/her idea. To guarantee the outcome quality, a strict contest requirements and schedules has to be followed by every participating individual or team. To motivate participants for joining and actively devoting their effort, different types of incentives are used, such as monetary rewards, public recognition, and sponsorship funding offers. Furthermore, often times a passion in the particular field of contest is the main driver for participants. Crow contest is an efficient way of leveraging a power of competition to generate new ideas and approaches based on the theme of the contest. Users of Netscape and Limewire were illegally distributing music through the web. In 2006, a new company named Grooveshark entered the market of sharing music. Instead of downloading the music, Grooveshark was a web-based music streaming service similar to Spotify, Pandora and Soundhound. Users could easily upload the digital audio files and share their music in the cloud with other users. The website of Grooveshark includes a search engine, streaming service and a recommendation system. 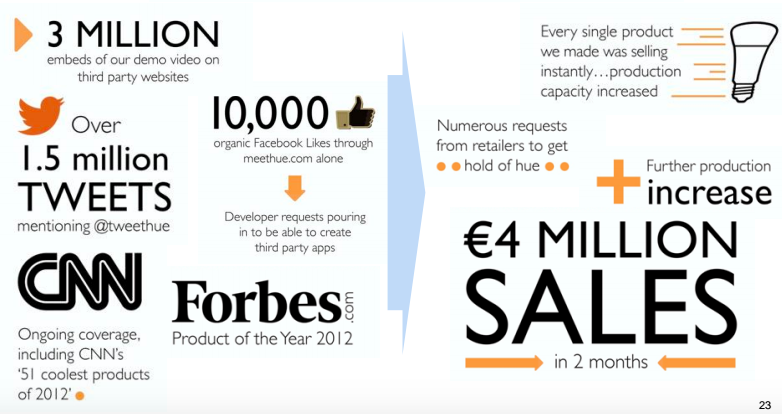 The content was crowd sourced and Grooveshark had 30 million active monthly users. A community section allows users to view recent activity of friends and use their social media accounts to connect. If you are now eager to check the website and use their music streaming service, you will be disappointed. The website is closed. The current status of the website is now defunct due to several legal cases against Grooveshark and substantial fines that makes the CEO say: ‘I’m Broke. I’m Literally Broke…’. Grooveshark stopped their streaming service for everyone on April 30th, 2015. In 2012, German users couldn’t stream music anymore. According to Grooveshark the German performance rights organization GEMA is the one who is responsible for this action. Due to high licensing fees, the operational costs would have surged which Grooveshark definitely cannot afford. Moreover, various U.S. lawsuits were pending against Grooveshark for distributing pirated digital audio files and not paying any royalties to Universal Music, Warner Music and EMI Music. Additionally, Apple removed Grooveshark app from the App Store and Google pulled the app even twice from the Play Store. In May 2012, Facebook removed Grooveshark and in 2013 Google censored the term Grooveshark from its Autocomplete feature. Grooveshark stated that firm complies with the rules and follows the procedure of the US’s Online Copyright Infringement Liability Limitation Act to remove piracy from its content. This didn’t solve the problem. In the first place, when Grooveshark removed pirated audio files, new ones show up almost immediately. Secondly, the employees were uploading pirated content by themselves. On top of all that, premium services for ad-free streaming services were sold to subscribers. Therefore, the judge of U.S. District Court in Manhatten ruled that Grooveshark was liable for infringement. Basically, Grooveshark didn’t have proper licenses and paid almost zero royalties. It is inevitable for Grooveshark to shut down, but they had endured a long time of legal fights before they had to settle with the major record companies, shut down the website and give up their patents and other intellectual properties. Big data, a broad term describing the collection and use of data so large and so complicated that traditional models do not suffice. With the digitalization of modern society big data has become a buzzword that is mentioned whenever and wherever. The possibilities seem endless, companies can find patterns and links in places where no one would have expected them. Amazon, for example, knows you so well that it can ship your next package before you even order it. This massive data collection hasn’t come without its negativity. How much information should be available for a company to use? Privacy concerns lead to regular court cases, where often the companies are forced to stop or change the way they collect data. Clearly there is a limit to data collection, or is there? The Chinese Academy says the Chinese society has changed over the past decades. China went from a from a society of acquaintances into a society of strangers. Huge cities have increased the anonymity of the Chinese citizen which led to trust being much harder to establish, thus hurting social and economic progress. ‘When people’s behavior isn’t bound by their morality, a system must be used to restrict their actions.’ The Social Credit System uses encouragement to keep trust and constraints against breaking trust as incentive mechanisms, and its objective is raising the honest mentality and credit levels of the entire society. China’s aim is clear, it wants to improve all citizens. Professor W. Shuqin, who works on the Social Credit System, further explains these intentions of china. Around half of all Chinese contracts are not fulfilled, this hurts the economy and is of low moral standard. Business in china is a dangerous and with this fast paced society it is important that people can verify each other’s creditworthiness. The social score can be used as a simple, accurate and fast check to see who you are doing business with. In its first introduction the Social Credit System might not be more than a fast and efficient way to check if you are dealing with an honest business man or not, but nothing stops China from adding more and more behavioral measurements to the credit system to steer its citizens. Future versions possibly include ranking of hobbies, searches, books you read or restaurants you visited. The Social Credit system could then be used instead of a resume, and certain jobs might only be attainable for the ones with extreme high credit scores. China can even link your score to your friends, thus punishing you when your friends ‘misbehave’. China’s implementation of big data might be impressive on a technological level, but feels scary on a moral level. The chairman and CEO of Chinese e-commerce giant Alibaba has a deep appreciation for the role of consumers in navigating a business. Alibaba’s social responsibility includes providing 0.3% of their revenue to environmental protection. His priority list, even surpassing social responsibility, includes businesses concentrating on Alibaba’s beliefs and hopes, the reasons as to why they got into this business and their approach in satisfying consumers, in contrast to focusing solely on profits and margins. Businesses need to think like their customers. Many technology innovators accentuate technology and place products above everything else, thus loosing sight of the target audience. Alibaba states that they look at technology through the eyes of their consumers. The great achievement of Alibaba thus far has been achieved through placing consumers first. This can be seen by their acquired knowledge and understanding of the Chinese Market, which has had an effect on their approach to even their product variety. They help small businesses and are adamant about caring more about them than caring for yourself. Alibaba makes it effortless for small businesses to use their website as they have constructed a customer-oriented design that makes it more easy for consumers to seek and buy items on this website. Businesses should treat their consumers like a crystal ball. Alibaba is dedicated on having a long-term vision for their business. The company has previously stated that this long-term vision requires them to not be sidetracked by transitory of the economy as it will have its ups and downs. Alibaba achieves this by being focused on the consumer and watching their actions as they have also predicted the rise of customer-to-business (C2B) corporate strategies for the near future, and predict that consumers will be empowered resulting in fully commanding their needs to companies. Businesses must create value for their consumers. Alibaba acknowledges that consumers are more then customer who buy products. The consumer of today is a member of society that is concerned with their environment and social outcomes. Companies must have this wider lens perspective when it comes to consumers. In this new era of empowered consumers, they select the brands that demonstrate the same ideals that support theirs, making them the values-driven consumers. Making some extra dough with Dominos’ dough. User-generated products nowadays full fill the needs of consumers all over the world. Nowadays, companies involve people more and more in the idea generation of products. Most companies see many benefits of the wisdom of the crowd and try to use the creative ideas of people by rewarding them with money. Research has shown that user-generated products are sold roughly twice as much as designer-generated products within the first year. Also, first-year sales revenue of user-generated products are three times higher than designer-generated products (Nishikawa, 2013). Like other companies such as Nike and Coca-Cola, Domino’s Pizza started exploring their market and the opportunities of user-generated products. Domino’s Pizza launched, in July 2014, their user-generated product website called ‘Pizza Mogul’. Pizza Mogul allows anyone in Australia to create their own pizza with Pizza Chef. When you’re done creating your pizza and making a name for your pizza, you have to log onto Facebook so you can share the pizza you’ve created. With this concept, Domino’s Pizza also create awareness on social media in order for the user to complete the process. After the whole process is done, the pizza will be listed on the Domino’s menu in minutes. However, it doesn’t end here! Users are able to earn money with their created pizzas. You can earn between 25c and $4.25 per pizza. In addition, you can also donate a percentage to charity. The leaderboards show top earning Moguls (users), Top Earning Pizzas, and the biggest givers to charity. Leaderboard create competition and a fun factor among the Moguls. Besides money, people can earn rewards in form of badges and bonuses. You might think creating pizzas isn’t profitable, but Pizza Mogul proves you wrong when showing you the leaderboards. #Pizza_master already earned $33,540 selling 19393 pizzas on Pizza Mogul, where the number two and three respectively earned $27,385 and $12,332. People like buying pizzas made by users rather than the company itself. In return, Domino’s can use the pizza names without giving any royalty for it. However, they give you a royalty when selling your pizza. So with the trend of companies trying to involve customers in the creation of products, companies should get more and more innovative when “luring” customers to their brand. As mentioned above, users can earn a fair amount of money when creating a product they like, and also like others to enjoy the product they make. Do you think that companies would need to attract users on other ways than the way domino’s does right now? Saturday the 25th of April, a disastrous earthquake hit Nepal. Homes have collapsed, century-old heritage sites have been destroyed, phone communications are still down, but most importantly of all – nearly 2,500 people are reported to have died during the disaster and thousands are still missing. People with relatives living or travelling in the area struck, often have no way of directly contacting them due to the damaged communication infrastructure. In an attempt to provide information and to aid rescue efforts, Google once again enabled its Person Finder. Google first launched the Person Finder after the 2010 earthquake in Haiti and has since opened the Person Finder in response to every other major calamity. The Person Finder is a missing persons database that allows people looking for their relatives and loved ones to search for their names by clicking on “I’m looking for someone”. 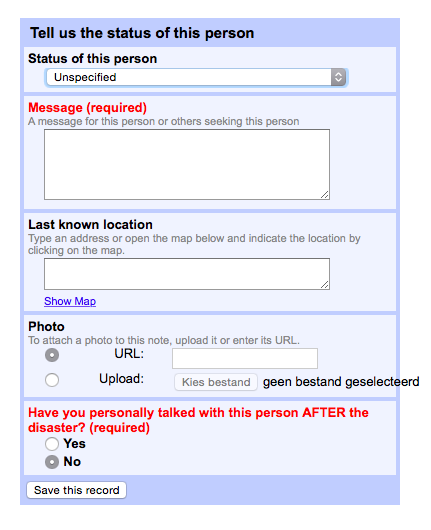 The database relies on individuals who have information on someone’s status in the areas struck to add a record to the database by clicking on “I have information about someone”. The record contains the name, physical characteristics, and a description of the person as well as information on his or her current status and contact details. In addition to user-added information, the database uses People Finder Interchange Format (PFIF) to aggregate missing persons information from registries of other organizations in an attempt to centralize the information. Person Finder depends on its users to update and remove records when no longer relevant. Users can also report spam, offensive content, or incorrect information. Records added to the database have a limited expiration date – after a certain number of days (minimum of 30), they are removed from the database unless manually extended by a user. As such, Person Finder is a fully crowd-sourced platform as it relies on user’s input of information. As of Sunday, a day after the earthquake, the database already contains 4700 records and is still growing. Firms knowledge about its’ customers over the last years has skyrocketed. With the rise of the internet came revolutionary ways to differentiate customers. The use of different tracking mechanism allows for a company to track the customer. The combined information that is gathered can be converted into a customer profile. Nowadays it is essential for shops to determine groups within those profiles. Easy ones are age, gender and location, but as more data is analyzed more profiles can be distinguished. This blog post will focus on a few of these customer profiles that are a bit harder to determine than age or gender. Strategic pricing is nothing new, segmentation between customers has been done for ages but it is time to bring it to the next level. Consumers are smarter than ever. Searching costs have dropped with increased ease of use of search engines. Reviews and technical information are for most product categories widely available, this relatively new development leads to improved product informedness; the consumer is better aware of what is in the market. Same goes for the price of products. Comparison sites make it much easier to quickly determine the average industry price, leading to a better price informedness; a customer that knows the value of the product. These factors together lead to a higher consumer informedness. With all this information available to the consumer, it becomes more and more difficult to define the perfect pricing strategy for your products. Research at the Erasmus University Rotterdam in collaboration with the Singapore Management University suggest that there is no perfect pricing for a product group. First of all the research made a difference between two types consumers. A commodity Segment and a differentiated segment. The first consumer group has a strong preference for choosing the product that offer the best price. The second group is willing to pay more if that means that the product fits better to their needs. The groups were analyzed using data that was collected through a series of stated choice experiments in two different contexts. Results were clear, one pricing strategy for a product just isn’t enough. A company needs to develop different pricing strategies depending on the kind of customer it is facing. The research found that different levels of informedness amplified different consumer segments. Consumers of the commodity segment, who highly valued price, where more influenced by a product offering high price informedness. Whereas the differentiated segments behavior was stronger amplified by an increase in product informedness. This means the firm needs to make sure the type of information available of the product matches with the type of customer that is interested in buying the product. For the company this leads to a necessity to use advanced tracking tools to determine the kind of consumer it is facing, and adjusting not just the price, but all the information available about that product. This will have as a possible result that customers see a totally different price and description compared to their friend or family member, even though it is exactly the same product. And for you: As a consumer you will get product and price information that is ‘tailor made’ to fit to your preferences, which sounds nice but it could for example mean that you pay a much higher price because the company knows you are using an expensive laptop. – Tsekouras, D. (2015). ‘Consumer Centric Digital Commerce session 4’. Business Information Mangement. RSM Erasmus University. Are you ready to beat the ‘Snake’ high score again?! In the past, Nokia has been the dominating player within the mobile phone industry. If you never have seen the 3310 model or played ‘Snake’ on one of the previous Finnish devices, you were probably born after the launch of the 3310 model in September 2000 (Techradar, 2014). In the upcoming years, Nokia’s senior management didn’t believe that the smartphones would conquer the mobile industry. A clear lack of vision: 1.2 billion smartphones were sold last year (NRC Q, 2014). When Nokia finally started selling smartphones, other players were already dominating the market. Nokia’s sales were dropping and the mobile department was sold to Microsoft in 2014. Last week, Re/code announced that Nokia is planning to return to the phone market in 2016 (Re/code, 2014). Initially, Nokia agreed with Microsoft not to manufacture any mobile phones until 2016. Although this agreement was signed, the Fins are allowed to sell Nokia products if manufactured by another company. Using this loophole, Nokia can start selling phones again (Emerce, 2014). It will be difficult for Nokia to attract customers when entering the highly competitive smartphone marker. Often marketing spending is invested in sales promotions to influence customers’ buying behaviour and attract new customers (Kim et al., 2014). To determine what the best strategy is for attracting new customers, Kim et al. (2014) compared price discounts and sampling to a more innovative method called pay-what-you-want (PWYW). When using a PWYW strategy, customers are able to determine the selling price themselves. Kim et al. (2014) found that PWYW is an entertaining way of promoting products to consumers. It can both lead to a higher word-of-mouth effect and more consumers that want to benefit from the promotion. Furthermore, the researchers found that the prices paid in a PWYW situation are significantly different than zero. So, PWYW is not just a fancy name for free sampling; people are more likely to pay for products even when they can get it for free (although the price paid is lower than the original price). PWYW can be an attractive way for Nokia to get in contact with potential customers and to create a positive hype (Kim et al., 2014). Compared to price discounts, in a PWYW situation consumers tend to pay less for a certain product. But, since PWYW attracts more consumers, Kim et al. (2014) found that this effect was compensated. If Nokia wants to settle in a highly diversified market again, it’s very important to reach a high number of customers. Instead of competing the current smartphone providers using price discounts, Nokia should use a PWYW strategy to reach more people and while earning more money. Smartphones are expansive products. Therefore, using a PWYW strategy to conquer the market can be risky. Although Kim et al. (2014) didn’t investigate the effect of it, they suggest using PWYW in a more restricted way in these cases. For instance, consumers can determine their discount based on a predefined list of discount percentages. By doing this, Nokia can influence the magnitude of the promotion but still take advantage of the PWYW benefits. Using a PWYW strategy can provide Nokia with a lot of new, and recurring(! ), customers. So, are you ready to beat the Snake high score again? Kim J. , Natter M., & Spann M. (2014) Sampling, discounts or pay-what-you-want: Two field experiments. International Journal of Research in Marketing, 31 (3), 327 – 334. Do Movie Reviews Affect the Box Office Revenues? The existence of Internet has changed our way of living. It has been a huge part of our life, one we simply cannot live without. We rely on it in almost every aspect of our lives, including when we seek for information. This also applies when we’re deciding what movies to watch. Before go to the cinema and watch a particular movie, some people usually checked the movie’s online reviews first. These movies’ reviews are online user reviews, and it is a form of electronic word-of-mouth (eWOM). According to Duan, Gu, and Whinston (2008), eWOM influences consumer purchase behaviour while it’s also the outcome of consumer purchases. But then, how these online user reviews actually impact the offline purchase? There are three measures of online user reviews, the volume (Liu 2006, Duan et al. 2008), the valence or the average (Liu 2006, Duan et al. 2008, Chevalier and Mayzlin 2006), and the variance in reviews (Godes and Mayzlin 2004). Chintagunta, Gopinath and Venkataraman (2010) measured the impact (valence, volume, and variance) of national online user reviews on designated market area (DMA)-level local geographic box office performance of movies in the United States. What’s different about their study is they used local geographic data instead of national-level data (used by previous studies) and the ‘when’ and ‘where’ a movie is released are taken into account. Thus, they measured user reviews when a movie was released in a market and those were written by users where the movie was previously released. The impact was measured by combining data from daily box office ticket sales on 148 movies released from November 2003 to February 2005 with user ratings from the Yahoo! Movies website. They found that the overall movie revenues is greatly affected by the opening day gross. As it was conducted on DMA, movie and market fixed effects were included thus taking into account their differences including movie genre and market size, and some other variables was also controlled such as advertising level and number of theaters. In their first study, using the local data, they found that the average user ratings influenced the box office performance the most. This finding is interesting since most previous studies found that it is the volume of reviews which matters the most to box office revenues. But when the national-level data was used, they arrived at the same results as previous studies. And at the last part of the study, they attempted to explain these results difference by using national-level models with market-level controls. This method gave the same result as the first study, the average of user ratings has the greatest impact on the box office revenues. It concluded that it is important to determine where the movie was played, whether on “new markets” or “old markets”, and only then the “true” effect of user ratings can be measured. As for us the movie goers, what the paper discovered is that we’re mostly affected by the average of ratings in deciding what movies to watch. Yet, how many people rated the movies (volume) is also an important aspect, as I would believe a slightly lower rating with much higher volume rather than a higher rating with much lower volume. In other words, volume and variance make a rating/review more trustworthy. Which one would you prefer? Chevalier, J. A., and Mayzlin, D. 2006. ‘The effect of word of mouth on sales: Online book reviews.’ Journal of Marketing Research, 43(3), 345-354. Chintagunta, P.K., Gopinath, S. and Venkataraman S. (2010). ‘The effects of online user reviews on movie box office performance: Accounting for sequential rollout and aggregation across local markets.’ Marketing Science, 29(5), 944–957. Duan, W., Gu, B., and Whinston, A.B. (2008), ‘The Dynamics of Online Word-of-Mouth and Product Sales — An Empirical Investigation of the Movie Industry,’ Journal of Retailing, 84(2) 233-242. Godes, D., and Mayzlin, D. 2004. ‘Using online conversations to study word-of-mouth communication.’ Marketing Science, 23(4), 545–560. Liu, Y. 2006. ‘Word of mouth for movies: Its dynamics and impact on box office revenue.’ J. Marketing, 70(3), 74-89. Imagine yourself as an entrepreneur in a startup who worked on a product for quite a while. Eventually, you come in contact with investors and customers who are really interested in your product. Due to the size of your company and the lack of a professional company website these customers are less likely to buy something from you. Imagine yourself now as a mobile developer. Previous years you trained yourself to design and build mobile applications and had some great projects you worked on. However, the company that had you on their payroll fired you. Although with your skills it wouldn’t be difficult to find a job, but you want more flexibility than your previous job. Both scenarios are possible within the platform Odesk.com. Odesk is a freelancer platform that creates its value by the number of businesses that are posting jobs on the site, but also the freelancers that are offering their services on the platform. Thus, the supply and demand create the value of the platform while the platform is a mediator for the users. Freelancers are users that offer their skills and experiences on the platform, for a price they consider to be right. When there are a lot of competitors, it’s best to compete with price. This also stimulates people with a rare skill to offer their services since no competition would influence the price. Also, freelancers are able to apply for a listing job. Businesses on the other hand can post jobs on the platform. When posting jobs, its common to fill in details for the job. Freelancers could apply to the job and businesses can pick someone out of the crowd. Businesses can select on experience and skills, but also writing style to pick the person that fits best to the job. This way, connecting to people jobs is a two-way relation. Besides oDesk being a mediator in freelancers finding jobs, oDesk offers protection to the businesses with their tool that captures work-in-progress snapshots of freelancers working on the job. Also, businesses only have to pay when they approve the work that has been done. In return for the services oDesk offers, Odesk receives a 10% fee of each payment. If the freelancer works per hour, Odesk receives 10% of the hourly rate. oDesk is operating since 2003, and has more than 1 million businesses that used their services. A while ago, oDesk and their competitor elance joined forces and are now connected with each other. Together, they have 9.7 million freelancers signed up; 2 million businesses that use their services and approximately $940 million worth of work done annually. oDesk is ensuring the world becomes more connected and is supporting competition among its users. However, since the world nowadays gets more connected through more platforms, I wonder what their next big step will be in staying competitive with other businesses that might enter their market. World’s Smartest Lightbulb meets Smart users! According to Randall et al (2005) moving the specification decisions of a product from producer to user can be a valuable decision considering that the user is the agent in the value chain with the most knowledge about user preferences. In the case of Philip’s HUE, this was certainly situation. The HUE lighting system uses LED bulbs – with a twist! Opposed to being controlled by a switch, the Hue bulbs are controlled with your smartphone using an IOS app. The light lets you switch between a wide spectrum of colours and brightness settings, allowing you to customize the lighting in your home around mood or setting (Forbes, 2013). The “how many years does it take to change a lightbulb” is an amusing creative video that will allow you to get a feel for the product. When the product was launched late in 2012, HUE had an enthusiastic group of users and hardware/software developers seeking to deliver extending compatible apps and integration with other products. Thus, Philips answered to this by formally launching HUE LED Lamp APIs and a software development kit. This opened the playing field for third party developers to create new, exciting applications using light (Philips 2013). 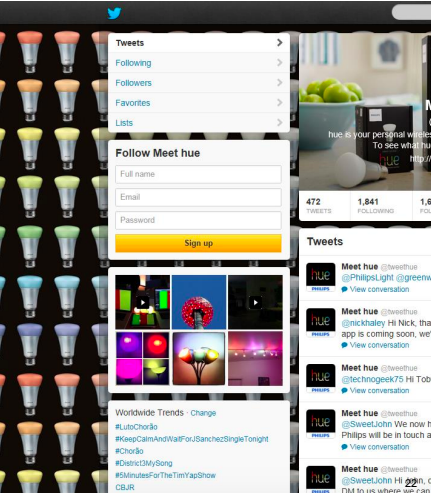 This was no mistake considering that the HUE community created rich functionality for an enhanced customer experience (Philips 2013). A cool example is that external developers have created apps that integrate Hue with music. Hue Disco controls HUE lamps dynamically based on the music beat picked up by the microphone in the smartphone (Ledsmagazine, 2013). Another example is a scheduling application that can integrate with a phone’s calendaring application. According to Kevin Toms, Developer Advocate of Hue’s software developers’ platform, the response from the HUE community has been incredibly positive (Philips, 2013). Philips thus aims to continue redefining the possibilities of light by enabling developers to create apps that customers want and need. How did Philips leverage developer communities for innovation? Results: Generating Innovation and PR that translates into sales! In Harvard’s Business Review article “How Pixar Fosters Collective Creativity”, Ed Catmull, computer scientist and current president of Pixar Animations and Walt Disney Animation Studios sheds some light on how Pixar continuously turns novel ideas into blockbuster films we all love. Catmull stresses that creativity is not a mysterious solo act. In filmmaking and many other kinds of complex product development, creativity involves a large number of people from different disciplines working effectively together to solve a great deal of problems. Since a movie contains tens of thousands of ideas, the director and the other creative leaders of a production do not come up with all the ideas by themselves. Rather, every single member in the 200-250 person production group makes suggestions. Creativity must be present at every level of every artistic and technical part. To come about this, there must be a strong feel for community where the environment nurtures trusting and respective relationships and unleashes everyone’s creativity. At Pixar it is all about the talented people, not just a set of good ideas. Catmull explains that if you want to be original you have to accept the uncertainty, even when it’s uncomfortable, and have the capability to recover when the organization takes a big risk and fails. The key to being able to recover: talented people! When Pixar hit a bit of a hard time when producing Toy Story 2 Catmull said that “If you give a good idea to a mediocre team, they’ll screw it up. But if you give a mediocre idea to a great team, they’ll make it work”. Create a peer culture. Encourage people across your organization to help each other produce the best work. Free up communication. The most efficient way to solve problems in complex projects like film-making, is to trust people to address difficulties directly, without first asking for permission. Thus, give everyone the freedom to communicate with anyone. Craft a learning environment. Reinforce the mind-set that you’re all learning – and it’s fun to learn together! Get more out of postmortems. People generally do not like to talk about what went wrong after completing a project and prefer to move on looking back at what went right. Postmortems should thus be structured so that it stimulates discussion. A creative gateway to the festival Extrema Outdoor, the design and inspiration for a new buddha to buddha bracelet or the design for a new tattoo for Dré Hazes. These requests or so called Calls for Creation have already been answered, co-created and fulfilled using the Created on Friday platform. Created on Friday is a video-based platform in which clients, creative minds and followers are connected in Creation Stories. With already 12 co-created final products and 16.000+ creative minds and followers, they are experiencing a promising start. What makes this platform different related to others and how does the consummation look like ? On the 1st Friday at midnight, the client submit a Call for Creation video. With uploading this video based Call on the online platform, a client opens the request for action towards creative minds. As already presented above, the topic of call for creation can be anything of choice based on the client request for a unique concept e.g. design, art or a new marketing campaign. During the first week, anyone with a creative mind can respond on a specific Call for Creation by uploading their creative solution. Again this response will be delivered in the format of a video-pitch. The video pitch will be shown to online crowd, to give them a proper feeling and understanding of the solution proposed by the creative mind (person, company). The online public or followers, in turn, will vote for their favorite videos resulting in a dynamic top 5 ranking on the basis of video views and votes during this week. On the 2nd Friday the top-5 will be frozen and the client decides which pitch will be awarded as the number one. Interesting fact is that the client still can decide to choose a winner outside of the top 5. Having said that the client’s favorites are presented in a frame on the client’s Call for Creation page. This way the client can influence indirectly followers’ voting behavior. The nr 2,3,4,5 of the video-based pitching contest will be awarded with money. Besides the financial rewarding, the top-5 creative minds and their solutions will be announced on the platform making use of a video. In this way the creative mind talents will be shown to all the followers. On top of that, the winning creative minds will be part of the Created on Friday wall of fame. During the second week, in a Meet & Making of, the client and winning creative mind co-create, further develop and fine-tune the winning idea into a final creation. Taking into account that the client is responsible for all the resources needed to come up with the final creation. After 14 days of pitching, voting and co-creating the final product will be presented. Not surprisingly, this will be done using a video message on the Created on Friday platform. Using online video content during the creation story, allows both clients, a creative mind and followers to share their findings and ideas towards a large crowd. In my opinion, the use of different social media channels ( YouTube, Facebook, Instagram ), makes Created on Friday a unique marketing “machine”. Secondly I am really curious about the impact Created on Friday could have on nowadays marketing/design agencies. Noticing that these agencies mostly of the time charge a lot of money and consume more than 2 weeks to come up with a final product. Since it’s founding by the end of 2014 , already 12 Creation Stories have been created. In my opinion, many more will follow. Top priority will be the supply of new Calls for Creation by clients. Nowadays, a lot of start-up pitches start with: “We are the Google of “fill in…”. Zeef.com did not, Zeef.com is saying they will do/are doing (a bit) the same as Google, only better. That sounds not realistic, but is it though? How it works? Everyone can set up a page about a specific topic. Within this topic page you can create different lists for subtopics; for example a HTML list (subtopic) within the topic web-development (example). Within this list you are able to rank different web pages based on content of HTML. Finally, if someone is searching for programming information on Zeef.com, it proposes a specific page about programming based on views, rating, etc. all in order to let him/her find the information. So, why do they think someone will create a page? Zeef.com integrates affiliate marketing within the pages; you can earn money by creating pages without using banners and other adds. If someone will buy something or clicks on specific content redirected by your Zeef page, both you and zeef.com will get a fee (if the specific webshop is using affiliate marketing). In first instance it sounds a bit like startpagina.nl to me, doesn’t it? The concept is the same, definitely. However, within startpagina.nl you cannot compete within topics. This competition needs to increase the quality of the pages. Besides, you can embed a Zeef-list into your own (blog) website, totally adjusted to your design (example). 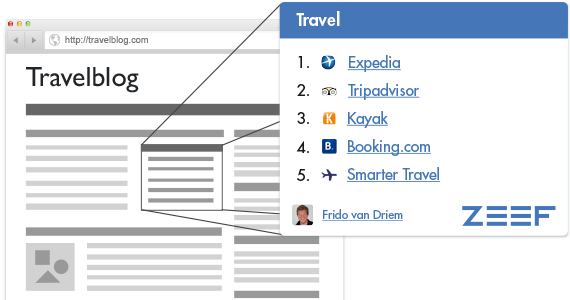 Zeef.com wants to concur with google Adsense in this way (frido van Driem – co-founder, 2015). Does it have a chance to survive? They attracted over 8000 curators/list makers within one year, besides they raised an investment of 1,2 million euro, end of 2014 in order to “take over” the US market. On top of that the adjusted lists are a lot more inviting than AdSense banners, resulting in a 15x higher click-through rate (CTR) than those AdSense banners. However, there is a huge critical mass within this market, you definitely need to collect a lot of curators in order to be the standard for someone within web searching. Besides, there is a chance that people only create pages that results in earning money for themselves, instead of sharing the “right” content of their topic (Abuse their knowledge). All in all, I like the idea and the opportunism of Zeef.com. I often think myself, wouldn’t it be great if someone who knows everything within this subject could help me out. However, maybe I am skeptical because I really like start-ups that want to beat the big boys by focusing on quality… Do you think I am? 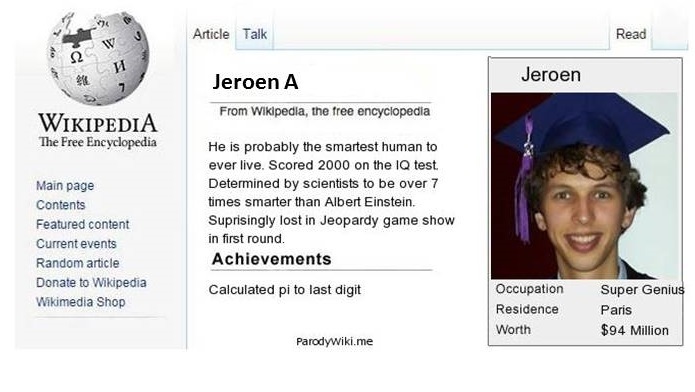 Van Driem, F. Co-founder Zeef (2015), Zeef – Waar hebben wij het over?, In: http://articulum.nl/algemeen/zeef-waar-hebben-wij-het/, By: Van Breda, N.